A recent Jezebel post caught my eye as it was about my favorite party game Cards Against Humanity. The writer, Katie JM Baker, seems to want to draw attention to the potential to offend some participants and that the offended will stay silent, scared of being told to lighten up or worse. But maybe they should lighten up, or at least rethink what they are doing playing that game. 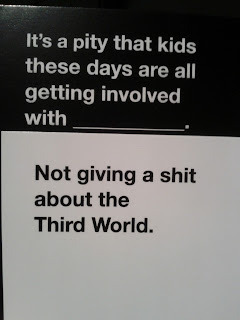 You have to keep in mind that Cards Against Humanity is a game designed to offend, and it is subtitled to remind you of that: "A party game for horrible people". The card combinations can be fearsomely offensive. But combinations like the one here (and way worse) are the point of the game. If people began saying various things offended them, people's play might be edited, or even worse, remain unedited. If that happens often enough, your might as well be playing Apples to Apples, not CAH. 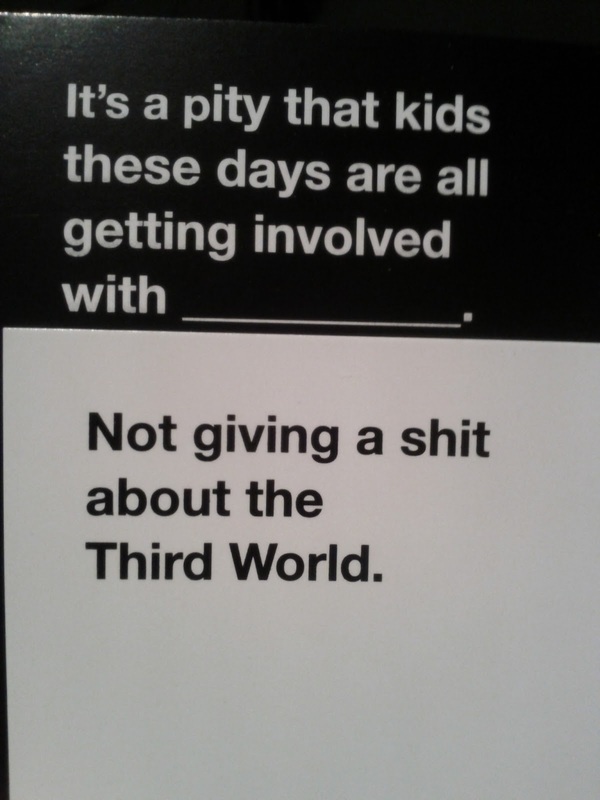 Cards Against Humanity is an offensive game for horrible people, and there is no room to think better of it. If you try it, find that the game crosses your lines and you become truly offended, then I think you should grin and bare it till the end or leave before the end, like you would a distasteful movie. Then chalk the experience up to learning that you need to get Apples to Apples ASAP, so in future, you can demand to play it when ever CAH is suggested. PS I really don't like Apples to Apples, which is mostly because it is not CAH... and also because I'm a horrible person. PPS Get Dixit instead. Seriously, Dixit is just a better inoffensive party game. This has also become one of our favourite party games and I would agree that this is definitely a game to be taken very lightly. However, I would put some onus on the owner and bringer of the game. A person should really, really know their crowd before they suggest this game. Breaking this out in a crowd of people you don't know that well is just a bad decision and tacky - clearly you need to be sure the other players are as horrible as you.